I love a new moon! This is where we come face to face with our shadow selves. This is the time where we embrace the dark parts of ourselves, and face the truth about what we regularly avoid about ourselves, others, and our lives. We all have the creative power and freedom to begin or begin again. We all have the freedom to chose paths, new and divine. There is happiness and joy when we focus our intent on happiness and joy. When we focus on fear and uncertainty, we create more of the same. A new moon is the beginning of the moon cycle where we can unveil what is holding us back, and transform that energy into a new mind set, new goals, new habits, and new environments. To set this energy in motion means you have to be open to the nudges the universe sends you to reach your destination. Maybe your changes need to be drastic, as in the case of an addict, or maybe just mild, as in saving more money for a vacation. Each is important, and following through on your comittment to yourself and your personal growth is priceless. Every intent you send out, and every goal you reach, you become stronger and your faith in yourself and your personal power increases. As we become more and more comfortable with our shadow selves, we become very comfortable with our true nature and sense of being. As unique as we are, so is our purpose and path here. The more we embrace the darkness and light of our being, the more complete and confident we will feel and the more understanding we will be of others. As we learn about our human nature, and embrace and respect it`s purpose, we can fully understand our lives up until this point with no judgement. Everything that you have endured and triumphed or failed at has had a purpose to evolve your soul. There is no judgement in the end, just the evaluation of our journey, a review of our physical life, and how we used it to evolve and balance out karmic events. When we change our perspective and view ourselves in such a non judgemental way, it`s easier to see what our true messages in this life are, and we can apply the wisdom we gather from our every day experiences here in the physical world. Always light a black candle during a new moon. I always light a New Moon candle from Coventry creations that is specifically made with oils and atoned with the energies for the new moon. Black candles are for protection and cleansing. Meditate with one and focus on digging to the root of what you want to change. With the issues illuminated, we can now heal and come to a solution for betterment. Labradorite is one of my favourite stones and I always wear a pendant around the new moon. Stone of Magic, a crystal of shamans, diviners, healers, and all who travel and embrace the universe seeking knowledge and guidance. For self-discovery, it is excellent for awakening one’s own awareness of inner spirit, intuition and psychic abilities. Labradorite is also the most powerful protector of the mineral kingdom, creating a shielding force throughout the aura and strengthening natural energies from within. Labradorite’s energy allows one to penetrate the veils of the Void, where all knowledge and possibility are held. I love a dark tarot or oracle deck. Having gone through the dark night of the soul myself a few years ago, I know the torment and discomfort of this spiritual unveiling, and also the priceless wisdom I received through the process. I have learned to draw on this wisdom of reality and truth when making decisions and choices, or I find myself dealing with recurving issues or problems. To reach in and draw upon your own flaws, imperfections and weaknesses for wisdom and direction in life is very powerful. Only then can we honestly make true choices for our own better good. Being in denial about our flaws and weaknesses causes us to make the same choices over and over again, sometimes not healthy ones. They are choices of least resistance which at the time might seem comfortable but in reality we are complying to our codependency, or bad addiction, or insecurities etc. When we are honest and embrace our ALL, we then can make real decisions for our own higher good based on real truth. Here are some cards I pulled from the beautiful deck Les Vampires by Lucy Cavendish. I called upon my guides for some messages for my followers on this new moon night of healing and illumination. Some very powerful messages filled with wisdom and insight, I hope that these words will touch your soul and offer words of guidance and truth. The first card of Jealousy is of Lamia who is a legendary creature from Greece. Because she was so beautiful and loved, she was cursed by the goddess Hera, the wife of Zeus. She was cursed to become a serpent from the waist down. Her message is to overcome spite and envy for your good fortune. Your desire to care for your own, your blessings and what you love has attracted envy from others. This has sparked quilt and fear within you. And now you are in danger of punishing yourself simply because another witnesses you to be hurt. Lamia is a serpent of the divine feminine, and a being who sheds skin. mothers fiercely and who can feel the faintest of changes in energy and vibration. You can sense change and are able to anticipate any threats or danger. Your eyes are wide open to observe all the changes and to be honest about what you are undergoing. she is a strong card, you have the ability to stay fierce, protect what you love, and connect with the Divine Feminine. It may also be that there is gossip about your appearance, and sexual behaviour. Call those who speak against you out, name them, and declare yourself free. do not let anyone question your behaviour when it is their own actions they are choosing to overlook. You are beyond judgement. You are a beautiful soul. The second card is Redemption. This is a card of healing, so when this card comes to you, you are being shown clearly that you need to feel the relief of saying sorry.l It hurts us when we hurt another. It is a form of self-abuse to indulge a momentary urge for spite, or selfishness, or greed, because your will pay for that, over and over. To say sorry is a humble, beautiful, strengthening thing. To say sorry, is to be redeemed from the self-hatred, the judgement, and the silent criticism that otherwise repeats throughout your mind. Be sorry for the right reasons, but not sorry for being human, for loving, for making a mistake. It is sorry for hurting another who expected that you be your best self. Being able to say sorry will lift any burdens you may be carrying from your shoulders. The third card is Her Last Day in the Light. There are many tines in your human life when you walk for the last time in a circumstance or situation, which you take very much for granted. This time is coming to an end, and a great source of security may be about to finish for you, and it will soon be your turn to have a hardship that only you can bear, and become heroic in the undertaking. Have no fear, because it is time to understand more of what you have avoided and what circumstance will to come will teach you. This will be difficult and you will struggle, but this ending must come for you to have greater illumination at a later time. You will become again one who walks in the miracle of the light, of colour and the creatures who live in the light. Soon you will go into the night of your soul, and you will confront parts of yourself that cannot be seen by the light of the sun. they can only be found as they shine in the dark. You will have courage, and faith. If you are already in this dark time, and this card emerged, then soon, you will walk again into the light. Prepare for change, and if you are currently in the darkness, you will soon emerge into light. A stunning deck designed for those facing difficult decisions, upheaval in relationships or wishing to move away from draining careers, situations or people. Vampire energies have often been feared and reviled, but today, the amazing creatures of ‘Les Vampires’ are proving to be allies from the most mysterious of realms, helping many humans through their own dark night of the soul. 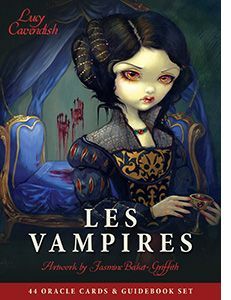 Full of wise guidance, ancient teachings, proven methods of protection, comforting advice and provocative challenges to our flawed perceptions, ‘Les Vampires’ offers a pathway through the darkest, most troubled times. Featuring the award-winning art of Jasmine Becket-Griffith and insightful wisdom channelled by Lucy Cavendish, ‘Les Vampires’ is a profound oracle to work with for healing our own inner fears, harnessing our power and dissolving the patterns that hold us back. Insightful, elegant, courageous and gorgeous, this is an oracle deck unlike any other you have experienced – until now. With 44 lavishly-painted cards, and a detailed guidebook including simple yet revealing layouts for your readings, this oracle deck will help you walk through night’s darkness, and return to the light of hope, health, healing and awareness. Great post! I really needed to hear all of this!